A lawn mower in Somerset has been named the oldest motorised mower in Britain in a national competition. The 1902 Ransomes model is part of a large private collection of vintage lawn mowers dating back to the 1850s. It is part of a private collection owned by the Hall and Duck Trust, based near Ilminster, which has around 1,500 models. The vintage mower won the Grass Masters competition organised by the car manufacturer Honda. Andrew Hall and his cousin, Mike Duck, began collecting vintage mowers nearly 40 years ago. They now specialise in restoring mowers, which are sold onto collectors or taken around the country for exhibitions. "We started collecting way back in the 1970s. People laughed at us then, they're not laughing now," said Andrew. It is because the pair are the proud owners of a unique lawn mower with a colourful history. "Ransomes, the main company in Ipswich which produced motorised mowers, sent a prototype to the 1902 motor car exhibition in Birmingham. "It was just a prototype but old man Cadbury came along and decided to buy it for their sports ground, but in 1905 because it was a prototype, the engine was no good. 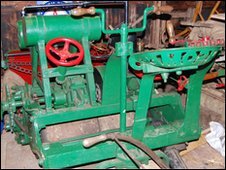 It got sent back to Ransomes and they rebuilt it with a new engine on in 1905." After that the mower was sold back into trade in 1920 but mysteriously disappeared for several decades. "Through the records we found that the Standard Car company in Coventry bought it for their sports ground. It remained at Standard Cars, which today is known as Peugeot. "Back in 1980 Ransomes rang us up to say, 'Peugeot says its got an old mower they've found in between a building'. "What they'd done in the 1930s was they'd put this mower up by the side of the building, and then decided to make this pavilion bigger and instead of knocking down the first building they built another one over the top. "When they knocked it down in the 1980s they found this machine sat between two walls." Now the mower, along with around 1,500 other vintage makes and models are safely housed in a secret location by the Hall and Duck Trust.